Steemers has published the findings of her research into the ecology of pre-school production. 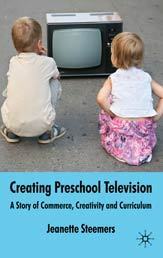 Focusing on the UK and US, this book shows how the pre-school television sector has shifted from a small localised industry to a complex, commercially-driven global business. It covers topics such as the contemporary pre-school market, the development and production process, players in the production sector, ancillary rights and retail, policy interventions, funding and the crisis in advertising and what happens to little kids’ TV in a multiplatform world. The publishers are offering CMC e-bulletin subscribers a 50% discount off the purchase price. To use this go to the publisher’s site and quote discount code WPRESCHOOL2010 when at the final point of the check-out. Seeking to broaden the public debate about the role of popular media in children’s lives, Messenger Davies addresses the continuing concerns around media ‘effects’ and critically examines the view that technology has dramatically changed modern children’s lives. It’s a broad-based study which includes classical art, fairy tales, and literature in its research, along with media such as television, gaming, and social networking. 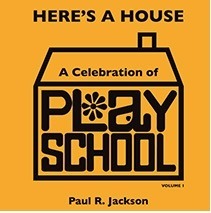 A comprehensive account of the iconic pre-school series in two volumes. This first covers the early years in the 1960s and 1970s, including Play School’s launch as (accidentally) the first programme on BBC TWO. It has entries on every presenter, and features all the major milestones. With contributions from hundreds of presenters, directors, musicians, designers and graphic designers and many previously unseen photos.